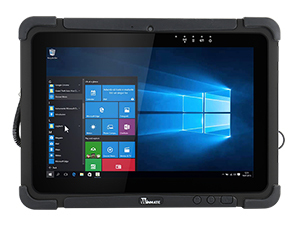 Back in 2013, Winmate Inc. of Taiwan tackled an interesting challenge, that of creating a rugged Windows-based tablet for users demanding state-of-the-art design and technology on par, or ahead of, with what was then available in the consumer tablet space. And it had to be tough and rugged enough to hold up on the job and in the field. And also thin and light enough to be carried around all day. The result was the Winmate M101B, which went on to become a big success. 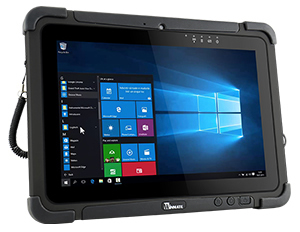 Fast-forward to April 2018, where Winmate just launched the next generation M101P. Winmate's genius in the initial introduction of the M101 line was in creating a design that looked clean and modern and just reminiscent enough of consumer tablets to cash in on their appeal. But it also communicated toughness with its corner guards sitting on extended bezels, but not so much toughness to associate the design with the big, heavy old-style tablets of the past. 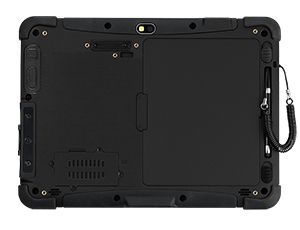 Winmate also clearly understood that since iPads had sharp, crisp and easily readable displays from the start, the M101 also had to have a sharp, crisp high resolution screen. And it needed dual cameras like consumer tablets, and great battery life, and also an optional active pen, because Windows can be a handful without a mouse and just fingers to operate it. Winmate got all of that right, and also realized that the proverbial "one size fits all" did not apply in their vertical markets. So they offered the M101 in a "light" version with a relatively simple Intel "Bay Trail" processor, a "high performance" version with a true-blue Intel Core processor, and then also Android. 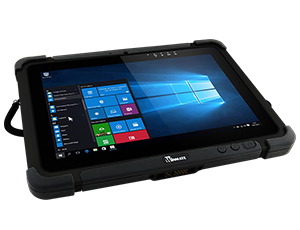 How does the new Winmate M101P differ from its M101B predecessor? Higher performance — With its Intel "Apollo Lake" processor, the new M101P has an inherent performance and efficiency edge over the older M101B. USB 3.0 Type C — The new M101P has a USB 3.0 Type C port replacing the LAN/RS232 combo connector on the old M101B. The Type C connector is smaller and reversible, so no more having to flip the USB connector around because you tried to put it in the wrong way. In addition, with an adapter, the USB Type-C port can output HDMI, VGA, DisplayPort, and more from a single USB port. Newer tech — As you'd expect from an upgrade, WiFi and Bluetooth are of newer and faster standards, GNSS now supports not only GPS but also GLONASS and BeiDou, the main camera has higher resolution (8mp instead of 5mp), there are now dual microphones with noise cancellation, and the screen is even brighter (800 nits instead of 700).